Greetings, and welcome to our bed and breakfast accommodations in St. Louis, MO! We’re Jerilyn and Gary Sadler, owners of the Fleur-de-Lys Mansion: we’ve come from Breckenridge, Colorado to delightfully charming Saint Louis to continue the traditions of luxurious romance that our frequent guests have come to expect. 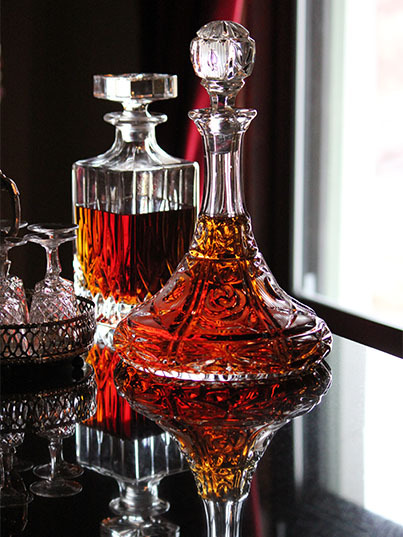 The Fleur-de-Lys Mansion family is here to serve your every need. Our staff keeps the Mansion sparkling clean, the sheets that we’re famous for ironed and smelling lavender fresh, and the house and grounds managed with loving care. Together we will do our best to make your stay a memorable experience that will have you coming back for more. Each morning, our guests are treated to a full and satisfying breakfast, featuring one of our many signature dishes. Please refer to our policies for important information about your stay. Should you have any questions, comments, or need pricing information, please don’t hesitate to contact us. Thank you so much for your interest in The Fleur-de-Lys Mansion, and we hope to welcome you here soon! 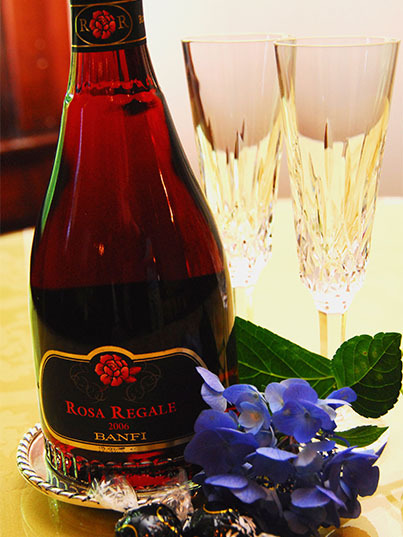 Bottle of Rosa Regale 2006 wine with blue hydrangea flower and two champagne flutes.